Mash a canned biscuit until it’s a flat circle. Add pizza sauce (or spaghetti sauce), mozzarella cheese and pepperoni. Bake at 400 degrees until cheese is melted. Kids LOVE to make these and its super easy and very low cost! My Hubby got me a KitchenAid mixer!! (…and a coffee cup, and some pink shooting glasses, and some ear plugs, and a cute little “I Love You” puppy, and….. The above post is from a blog I’ve recently been reading. Getting rid of “stuff” in our lives feels soooooo good — especially when you can pass it along to others! With the recent moves we have made, I’ve had the opportunity to cull out the unused and unnecessary. Passing clothes on to friends who will use them, or making a donation at the local Goodwill is just two ways we can all share the bountiful blessings God has provided. To keep them when they aren’t even being used is just contrary to the life God has for us. Look around you! Is there something sitting in your closet that your neighbor or friend could benefit from? Are there children you know that are just beneath the clothes and shoe sizes of your own? Bless their parents with a commitment to pass down clothes each time your children grow out of them! Help a single mother out with some furniture or unused appliances. Trade in books, video games, and movies for a little extra cash to pay down your debts. Host a garage sale and commit to use all the proceeds toward adoption costs for this family, or perhaps for another great cause. When we take the time to declutter, the focus of our life turns back to God, His mission, and purposes. Stuff is just stuff; people matter more. I’m just going to say it: I’m a reformed hoarder. I have owned more things in my lifetime than any woman my age has business owning in her lifetime. In fact, in my younger years there was a nagging fear in the back of my mind that I might one day be buried somewhere under a pile of paper, old clothes, and strange kitchen appliances. Thankfully, a few really brave friends stepped in to help before it was too late. With their help, and some Scriptural perspective, I have overcome. I no longer serve my stuff… it serves me. At least, I think so. There is the danger that I will look back at this post in four years and sadly shake my head, knowing that I had not yet mastered my own stewardship of belongings. Actually, that’s a likelihood. Thank God we keep growing! Ants are phenomenal creatures. We have been studying them, along with other social insects this week. The boys have learned their body parts, jobs, and alot about their design. God did an amazing thing when he created ants! One thing we have learned is that aphids and ants are dependent on each other. Aphids are small insects that feed on the sap of newly sprouted stems, leaves, and flowers. Eating the sap inside these fresh plants causes a special substance called honeydew to form inside the aphid’s body. Ants will “milk” an aphid by rubbing the aphid’s back with its antennae. The honeydew squeezes out of the aphid’s abdomen, and the ant enjoys a nice taste. 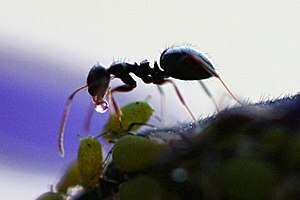 Ants protect the aphids in exchange for the opportunity to drink the honeydew liquid. Not only are ants productive, they are also social. They need each other to sustain the colony. Each one knows their job and does it day-to-day without hesitation. One ant could not live alone. They need other ants and sometime other bugs such as aphids to survive. What can we learn from this? As individuals and as especially in homeschooling situations, it is important to remember that we need others to be successful, happy, and productive. When things gets hard it is easy to retreat to our lonely shell, but over time that shell is just unhealthy to be under. God created us for fellowship with one another. We need to love and be loved. We need conversation. We need eye contact. We need an occasional hug or even a pat on the back. Consider the ants. Leave the shell. Reach out and get to know people. Invite someone to dinner or a play date at the park. Befriend the aphids in your life, and together you can both sit down and enjoy the sweet nectar God intended you to have! It’s hard to believe he’s “double digits”. We woke him up with very bad singing this morning and a donut on the family birthday plate. It rotates and plays the Happy Birthday song. My kids in their younger years have all been afraid of the creepy clown, lol. Its a tradition, though, and many birthday breakfasts have been served there!